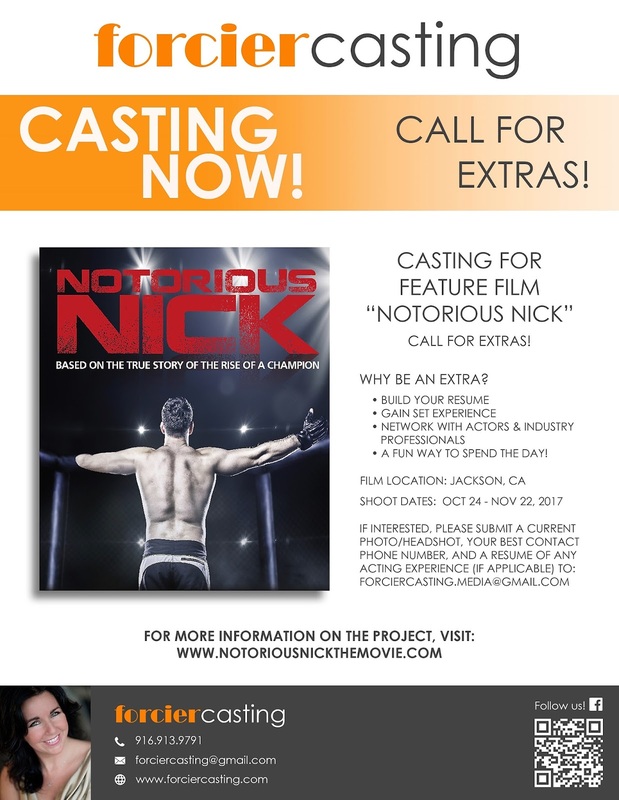 Northern California's Acting and Film Community Continues to Burgeon as Local Sacramento Casting Director Sally Forcier of Forcier Casting Seeks Talent for SAG Feature Film Production Notorious Nick, Filming in Jackson, CA in October 2017. SACRAMENTO, CA – 22 September 2017 – Sacramento and surrounding areas have enjoyed being featured locations in a stream of popular film projects as of late; a result of several talented native Sacramentans returning home for inspiration, and bringing a taste of Hollywood with them. In 2016, writer and director Deon Taylor’s Meet the Blacks was released, which filmed in select locations in nearby Placerville County. Taylor returned shortly after to nearby El Dorado County to film another feature length film, Traffik, starring Omar Epps and Paula Patton. Traffik, for which Forcier Casting handled all of the production’s Northern California casting needs, has recently been acquired by Lionsgate/Codeblack and is slated to release April 2018. Currently, Oscar-buzz is ramping up for Greta Gerwig's Lady Bird, slated to hit theaters November 10, 2017. Gerwig spoke of Sacramento as a "its own character" in terms of its importance to the film, and chose to shoot scenes in the East Sacramento neighborhood known as the Fabulous Forties. According to Sally Forcier of Forcier Casting and Forcier Productions, the trend of filming in Sacramento and surrounding areas is not slowing down anytime soon. Having been in the business of show business for the last 23 years, Sally has developed relationships with producers living locally in Northern California who simply want to work where they live, doing what they love. Dedicated to bringing more film projects to the area are producers Mark S. Allen and Howard Burd, who recently wrapped filming on their latest project, Apparition, to which Sally Forcier is credited as both Co-Producer and Casting Director. With Apparition "in the can," as they say, this team has already hit the ground running on their next project, Notorious Nick, a SAG feature length film set to begin shooting in nearby Jackson, CA at the end of October 2017. Principal casting for Notorious Nick is currently underway with Forcier Casting in Sacramento, with extra casting to commence at the beginning of October 2017. This is a great opportunity for both local actors and people new to the movie business to get a taste of Hollywood, without the six-hour drive! Local talent interested in being a part of the film Notorious Nick may submit their interest to Forcier Casting via e-mail with an attached headshot/photo and resume to: forciercasting@gmail.com. Information and updates regarding casting are also available on Forcier Casting’s Facebook page. For more information on the project Notorious Nick, visit: www.notoriousnickthemovie.com. Reel Gold in the Mother Lode! The Sutter Creek International Film Festival returns for 2017, expanded by a day from last year. We have films from Australia, India, Iran, Italy, and Switzerland among others. Shorts, full length features, animated, and documentaries. We have discussion panels with directors and actors, an awards dinner, breakfasts with filmmakers, mixers, and much more. The SUTTER CREEK INTERNATIONAL FILM FESTIVAL (SCIFF) is a premiere 4-day annual event. The SCIFF showcases cutting edge, as well as contemporary film screenings at the historic SUTTER CREEK THEATRE. SCIFF is proud to embrace the reasons Film Festivals were invented, in its meticulous programming guidelines. From cutting edge documentaries to tried-and-true Indie films, SCIFF celebrates film on the ‘big screen’ by offering something for everyone. Experience HOLLYWOOD-STYLE EVENTS that pair excellent local wines with your film experience, or the RED CARPET EVENTS, where we welcome celebrities from Hollywood, filmmakers, and world known figures. 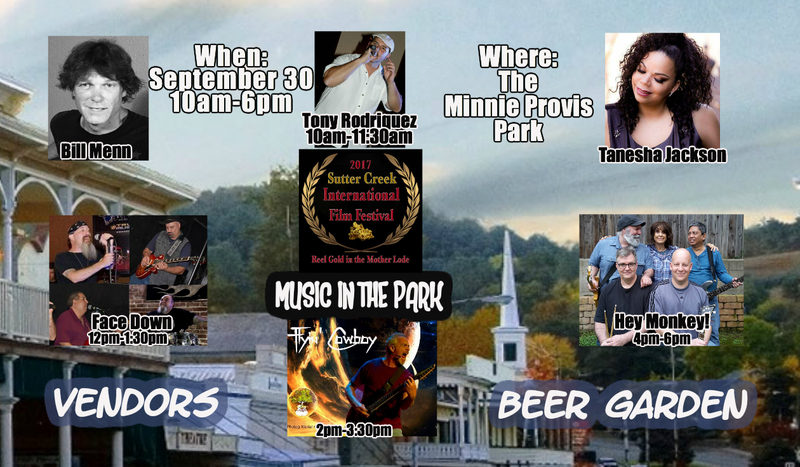 There will be free music in the Minnie Provis Park on Saturday, Sept. 30. Enjoy premieres of INDEPENDENT FILMS – films that you may not have a chance to see anywhere else. Filmmakers from all over the world attend the Festival and offer an intimate, but informative Q & A sessions after the screening of their films. We at SUTTER CREEK INTERNATIONAL FILM FESTIVAL will entertain, educate and inspire film-goers and filmmakers, from around the world. 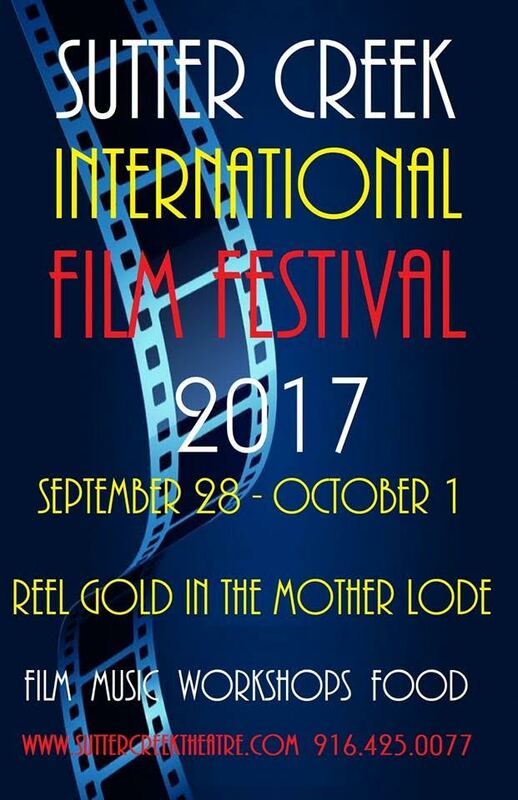 Sutter Creek International Film Festival - where Indie film matters! 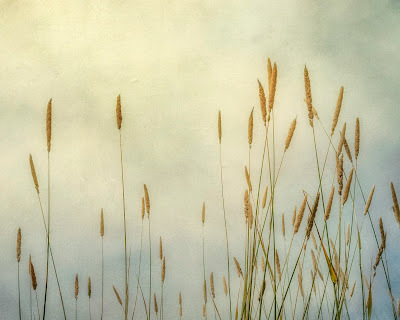 The AmadorArts Gallery at 11-A Randolph Street, Sutter Creek,, still has the Preview Show featuring the 25 artists who are participating in Open Studios Event this Saturday, the 16, 10am - 6 pm, and Sunday, Sept 17, 10 am – 4pm. Every kind of art imaginable is there and is for sale! 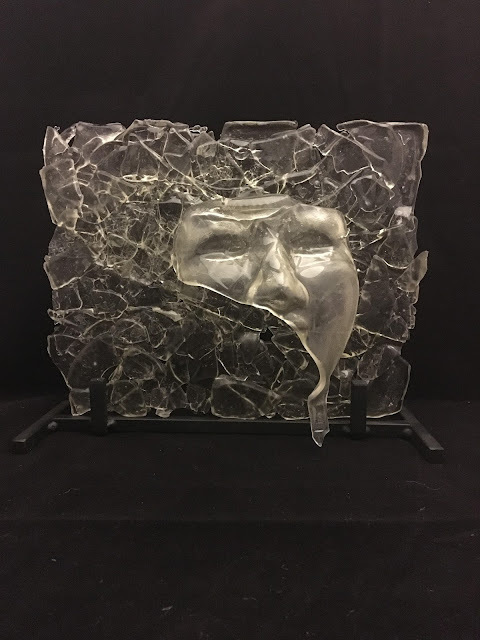 Opening on October 7 during the 1st Saturday Art Trek will be an unusual show of two artists who have taken photography and glass art to new levels. The AmadorArts Gallery will feature encaustic photo art by Sacramento artist Dianne Poinski and recycled glass art by Sheri Kindsvater from Rancho Cordova. 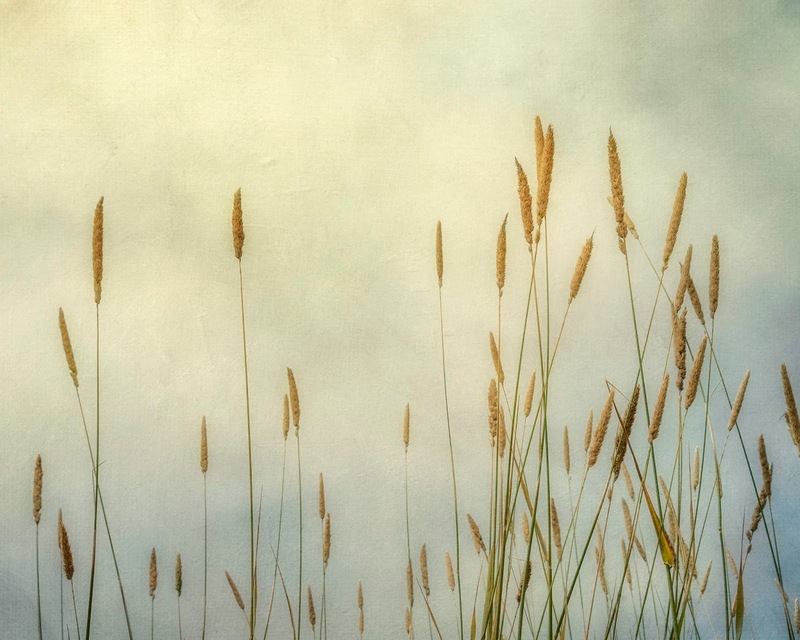 The Art Trek reception on Saturday, October 7 is from 2 to 5 pm. The exhibit will run through Sunday, October 29. Gallery hours on weekends are 11:00 am to 4:00 pm. The AmadorArts Gallery is open during the week, Tuesday through Friday, but it’s best to call ahead, 209-267-9038, because the staff might be out for meetings. 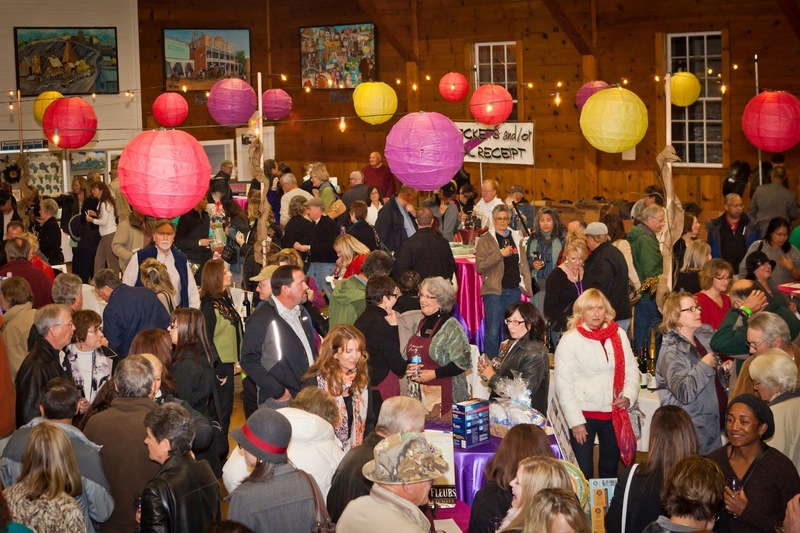 Tickets are now on sale for the 20th annual Winefest, the popular walk-about wine-tasting event that will take place in Amador County on Sutter Creek’s historic Main Street on Saturday, November 11th. 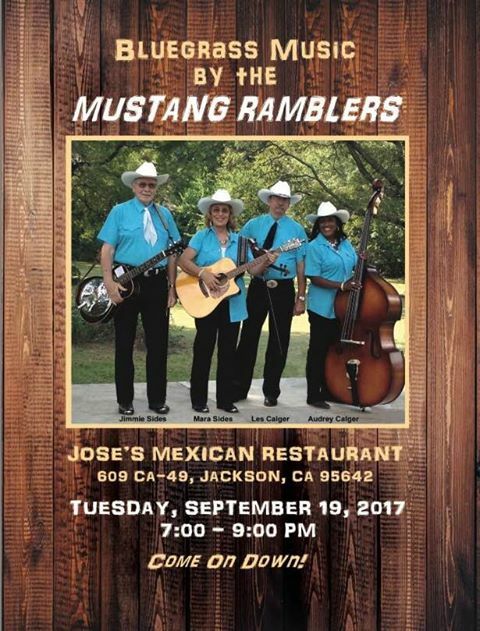 For comfort and safety, the number of tickets to be sold is limited to this event, a fundraiser for AmadorArts, a non-profit established 35 years ago. Winefest usually sells out. 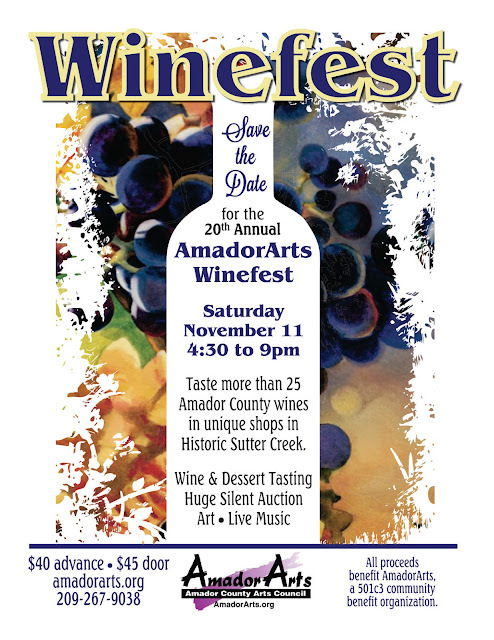 Over 25 Amador County wineries will each be pouring in one of the unique shops. Check-in starts at 4:00 pm in the Sutter Creek Auditorium, 18 Main St., where guests will receive an event glass, map, and wrist band and may start bidding on the Silent Auctions of Art, Wines, and Premier Offerings of Gifts and Event Packages. New this year will be the exclusive showing of the magnificent life-size Feather Fairy sculpture created over a three-year period by internationally known artist Lorra Lee Rose. Not a part of the auction, it can be purchased for a specified sum worthy of its artistry. 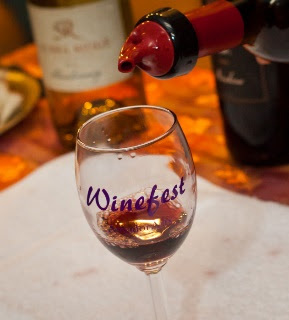 Main Street will be ready for the wine-tasting at 4:30 pm until 7 pm. 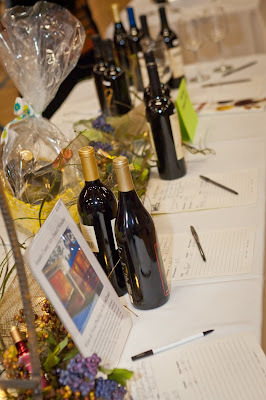 Then, the auditorium will feature live music, tastings of desserts and after-dinner wines, and final auction bidding. Advance tickets of $40 may be ordered using PayPal at www.amadorarts.org. Local locations are listed on the website. At the door on Nov. 11, if still available, tickets will be $45. 209-267-9038.